Get ready for an amazing gaming experience through this wonderful Microgaming powered slot machine. The game is called Old King Cole, this is why players will quickly notice the royal theme of the game as it invites them to accompany old king Cole in his royal adventures as they get to claim their own share of his riches and his fortunes. 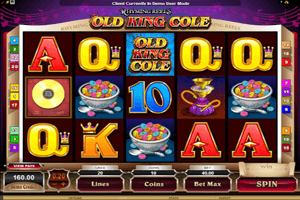 Play Old King Cole Slot here. King Cole is not an uptight king, on the contrary, he loves to have fun and enjoy himself. This is why the symbols that will land on the reels are all inspired by his fun lifestyle as they include a cup of cereal, a crown, a music band and the king himself. The game belongs to the Rhyming Reels gaming series, this is why as players spin the reels and as they form winning combos, they will get to enjoy the great music that comes along with these actions. The logo of the game is a wild icon that can replace all icons during the main game, except the scatter crown. The golden record acts as a well during free spins only, but also, it wouldn’t be able to fill in for the scatter crown symbol. The scatter symbol gives away great scattered rewards on top of triggering the bonus free spins round in which players will claim twelve free spins with a multiplier that can amount up to 7x.